Step Right Up To The Front Of The Class — It’s Book Report Time! It’s been a while — a long, long while — since I last stepped up to the front of the class for a book report, so I figure I should remedy that. I haven’t been reading as voraciously as usual, and part of that reason is a general frustration for books that come recommended and yet bore me silly after the first couple dozen pages. Best Served Cold – I’m a tentative Joe Abercrombie fan, because while I do love his writing, his imagination, and the gritty feel of his worlds, it’s almost too dark, depressing and cynical to love. The First Law trilogy was excellent for the most part, but it ended abruptly and somewhat anticlimactically. 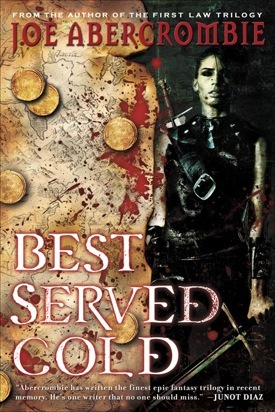 Best Served Cold is set in the same world, but it’s an off-shoot with a new character, an angry female warrior who is betrayed, left for dead, and embarks on an epic journey of revenge. It’s wild to see how her vengeance both shapes the events of the world around her and how it brings more misery and suffering, but it kept me reading right up to the end. The Girl Who Played With Fire/The Girl With The Dragon Tattoo – Okay, for some reason these are insanely popular all around the world, and while I found them decent reads, I don’t see what the fuss is about. The English translation feels a bit clunky, on top of a plot that is far from nail-biting — I guess I can be gracious and say that it is intriguing, but not to the point where I couldn’t put it down. I haven’t felt the urge to read the third book yet, so… yeah. The Passage – Another huge best-seller, and one I should’ve been on board with. An apocalypse caused by truly scary, near-unstoppable vampires? Yeah, it’s a good setup. And then the author just draaaaaags everything out far too long, gives us characters that aren’t that relatable, and ends on a limp note (it’s the first part of a series, apparently). I liked a lot of the things in this novel, but a spiritual successor to The Stand this is not. Finch – I’m probably going to finish this book, although it’s a little too dreary for my taste. It’s basically a detective murder mystery set in a weird fantasy city where mushroom people have conquered the locals and are keeping them under an oppressive rule. Bright of the Sky – It was free on Kindle, always a plus, but after the cool opening chapters set in our future, it jumped into a fantasy world that I didn’t find too appealing. The Magic Thief – Hoping for a bit of the Harry Potter vibe here, but this author writes way too quick, stilted and dull to keep my interest. Can’t believe it’s a series. Containment – Another free Kindle book that I never heard of, this is a mystery/thriller set on a Venusian colony in the future. I’m not attached to the characters, but I kind of like the vision for it. The House of the Stag – Apparently this author is hot stuff, but I really couldn’t get into it at all. Pass. The Lost Fleet: Dauntless – Horribly-written military scifi. Characterizations were way off. Foul Moon – I know everyone just loves and loves the Dresden Files, but I’ve been slogging my way through his second book without seeing the fun. The Way of the Kings – It was funny to see MMO Gamer Chick write about this, because I’m in the middle of reading it as well. Brandon Sanderson has quickly risen to the level of “I’ll read anything — except Wheel of Time — that he writes, sight unseen.” He’s just an easy read, and fulfills my cardinal rule of novel writing: Something interesting must happen in every chapter. I can’t believe it’s only the first book of a series, but hey, more for me. Sanderson comes up with yet another nifty magic system (this one to do with gems) that takes this outside of typical fantasy humdrum. Thank you! I loved the first third, could have done without the second third and HATED the last third. I have only recently discovered Joe Abercrombie and like you I find his books compulsive reading but also cynically depressing. The ending to the First law trilogy was like a kick in the teeth. I much preferred the ending of Best Served Cold. While not exactly an up beat ending at least it allows some wriggle room. Actually while I am here I will pass on a recommendation for a book I have just finished:”The Left Hand of God” by Paul Hoffman. It is a Dark tale set in a fantasy medieval kingdom. There is no magic involved but the country is best by fanatical religious wars. If you like Abercrombie I think you will like this. I should warn you that the book borrows extensively from Christianity for its depiction of religion but the story is not actually about any real world religion. It is a pity really because some of the references might offend people unnecessarily. Why will you not read The Wheel of Time? I find that Brandon Sanderson has done an excellent job so far of finishing up the series. @ Padyndas – WoT is one of my most-loathed series. I could go on a huge rant, but suffice to say that I got sick of Robert Jordan writing unlikable characters, being extremely sexist, reusing phrases too often, and padding his books out with a whole lot of nothing. @Syp-Well I disagree with you about the Wheel of Time series as I find it to be quite well written and love how detail oriented it is. That said I think you might find that Brandon Sanderson’s style does move into the Wheel of time series as well. It is certainly a different change of pace and is more of Sanderson’s style than Jordan’s. If you like Sanderson’s other books you might be surprised at how much you like his Wot books as well. Of course if you have not read the prior 11 books it might not make much sense. I hope you’ll enjoy The Way of Kings as much as I did. Thanks for the linkage by the way. I’ve actually also got my eye on Joe Abercrombie, and have The First Law trilogy in my to-read list. I don’t mind dark at all, in fact I’m often drawn to books that are that way, so I’m really looking forward to checking out his novels. Have you read any books by David Gemmell? His Drenai series is pretty amazing. So far I have read The Swords of Night and Day & White Wolf (yes, I am reading the series backwards). Great books written in the vein of heroic fantasy. Looks like I’ve got some books to put on my to-do list! Might I suggest the Song of Ice and Fire series (if you haven’t read them yet). I started with A Game of Thrones and I haven’t been able to put the books down (currently on book 3). I love it when you do these posts. It gives me good ideas for what to pick up next! Have you ever read anything by Tad Williams? He’s a bit long winded but I’ve fallen in love with how well written everything is. I picked up the cyberpunk book Otherland: City of Golden Shadow on Andrew of Systemic Babble’s recommendation and fell in love with it– expected to hate it going in, funnily enough, since I’m not a real cyberpunk fan. From there I grabbed the first book in the Memory, Sorrow, and Thorn series. Though the first 150 pages are hard to get through, I’m enraptured with the storytelling. It reminds me a bit of GRRM’s SIAF series. I picked up Mistborn after you reviewed that series and I loved each of them. I then went back and Elantris and loved it. Warbreaker couldn’t get my attention, I maybe read 1/4 of it and stopped. I am currently about 1/3 of the way through The Way of Kings and love it just as much as Mistborn…if not more. Thanks for that first recommendation about Mistborn. Also i greatly enjoyed the Night Angel Trilogy and have The Black Prism waiting once I finish my current reading. @ Waafer – I read one of his books, but nothing past that. Maybe I’ll check him out again. @ Cupp221 – Definitely, an excellent series! @ Chris – I vaguely remember Williams from back in the day, but it’s been a while. I might need to go back and see. @ Grombeck – I’ve heard a lot of good things about the Night Angel series, thanks for the recommendation! Seeing Brandon Sanderson at Dragon*Con this year was great. For someone as busy as he seems to be, he really has it together and takes time to talk to the fans of his books and/or the Wheel of Time. My reaction is the same as yours. That said, I read it in conjunction with my 10 year old daughter, who fortunately is turning out to be a geek like dear old dad. While I found it light and borderline unsatisfying it was definitely targeted to her age group (and not much beyond age 10) so I was able to enjoy it for what it was. Harry Potter, while appealing to a much broader age range, had a lot of layers in it that escaped the younger reads. Magic Thief is operating at a single layer and that’s fine for what it is. My daughter and I have read the entire series and it’s enjoyable as long as you keep reminding yourself it’s a kids series. I agree with you on WoT. I got extremely frustrated because books after #1 felt like a lot of reused material and slow progression that didn’t really match the length and density of the books. Stick with the Dresden books, they are of inconsistent quality and, to be honest, they dropptgooed off in the middle of the series, but the last 3 books have been extremely enjoyable. Not sure what happened with Butcher but he’s back in series fully energized and is taking Harry in some very interesting directions. I also just finished the first book in Stephen Kings’ The Dark Tower series (The Gunslinger). All I can say is that it was really different. I’m not sure if I like how flippantly the main character deals with demons but otherwise, I really enjoyed the vivid imagery. King has a way of using just a few words to stir up the imagination. Not sure if I will continue to read through the series but it was a nice break. The weakest books in the Dresden Files series are books 1 and 2. I usually start my friends on Grave Peril and Summer Knight (books 3 and 4), and only once they’ve invested into the story of Harry to go back and read books 1 and 2. I really enjoyed The Painted Man (perhaps The Warded Man depending on where you are) and the follow up (The Desert Spear).